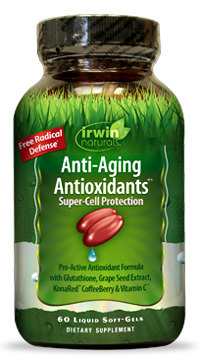 Anti-Aging Antioxidants, 60 liquid softgels (Irwin Naturals) - Penn Herb Co. Ltd. The "free radical theory of aging” states that the inborn process of aging is caused by the accumulation of free radical damage inside the body. This theory is supported by countless studies and suggests that antioxidants can help neutralize the effects of natural aging. Boost Your Antioxidant Defense Systems! Take 2 liquid soft gels daily with a meal and a full glass of water. USAGE WARNINGS: Check with your doctor before using this product if you are using medication or have any medical conditions. See PDF Label for additional warnings.